Experience the unearthly panoramas of Chile’s Atacama Desert on an enriching 4-day excursion from Calama to San Pedro de Atacama. 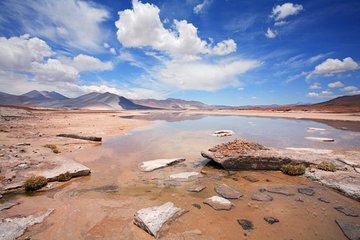 See the lunar landscape of Moon Valley; watch the sun rise over the shimmering surface of salt flats; witness molten spurts of water shoot from the ground at the Geysers del Tatio; and be mesmerized by the crystalline beauty of the Miscanti and Menique lagoons in Death Valley, one of the driest places on earth. Luxuriate in either three- or four-star accommodation on this incredible tour and enjoy the convenience of round-trip airport transportation in a spacious vehicle. See the lunar landscapes and breathtaking beauty of the Atacama Desert in Chile on this incredible 4-day guided tour. Watch enchanting sunrises over geothermic geysers; witness flamingoes frolic in the vibrant shallows of lagoons; and experience the climate in one of the world’s driest places. Round-trip airport transportation and accommodation in either a three- or four-star hotel is included in the hotel, in addition to breakfast and meals indicated in the Itinerary section. After being met at Calama airport, you’ll be transferred to the village of San Pedro de Atacama. Spend the afternoon with your guide on a scenic drive to Salt Mountain and Valle de Marte (Chile’s Death Valley), and watch a spectacular sunset in the extraordinary landscape of Moon Valley. You’ll then be transferred to your selected hotel, where the rest of the afternoon and evening are yours to explore San Pedro on your own. Following breakfast, you'll be driven out to the Atacama Salt Flat to see three species of flamingos nesting on Lake Chaxa. After visiting the picturesque town of Toconao, renowned for its classic bell tower, continue on to the village of Socaire and the altiplanic lagoons of Meñique and Miscanti. Ringed by volcanoes of the Andes Mountains chain, the vivid blue lakes lie 14,850 feet (4,500 meters) above sea level and are protected by Flamingos National Reserve (Reserva Nacional Los Flamencos). Returning to your selected hotel, you’ll have the rest of the day and evening to spend at your leisure. It’s a pre-dawn start today, departing your hotel at 4am to reach the Geysers del Tatio by sunrise. Once at the geysers, enjoy a breakfast box before taking a guided walk around the geothermal field, seeing the breathtaking sight of columns of steam rising from the ground as the sun rises over the Andes Mountains. The return drive to San Pedro de Atacama provides fabulous views of the Torcopuri and Sairecabur volcanoes. After being dropped off at your hotel in San Pedro, you’ll have the rest of the day and evening to visit the town’s lively market and spend your time as you please. After breakfast, a transfer takes you to Calama airport to catch your onward flight. Minimum of 2 passengers apply. In case of 1 single traveller, confirmation will be sent depending on the number of passengers booked on this tour. We had a great time on this trip. All the tour guides and drivers were knowledgeable and professional. They picked us up right at our hotel every day at the exact time we were told. Bottled water was plentiful (great since we were in the desert). So many nice touches, freshly cooked breakfast at the geysers, wine and cheese at Moon Valley. I would do this again in a minute! Very good guides and excellent excursions. We paid for a 4 star hotel, but got put into a 3 star hotel which was undergoing major building works. You have to visit this place to appreciate the stunning views. Flamingos in a desert seems very odd. We also visited Red Rock which is stunning and doesn't look real. Valley of Mars is also so good. There are many places to visit here and the views are fantastic as you cannot believe that you are seeing so many different areas in the driest desert in the world. Well worth the visit. The actaul trip was great, but the organisation was pathethic. Had to chase the airport transfer, no information at the airport. at the hotel there was a note re collection time, and nothing else. No itinerary whatsoever. no info for day 2 other than a collection time. Finally on the evening of day 2 there was information at the hotel for days 12 already over. after day 3 the last day there was an Itinary waiting for us at the hotel, in Spanish I'm an Irishman living in Australia so that was both unhelpful and so late that it was redundant. Final morning, airport transfer rolled up 40 mins late, and the driver didn't know his way around to the last 2 hotel pickups. My advice, book it directly when you arrive in San Pedro de Atacama. As for the place, we absolutely loved it. The tour met or exceeded expectations. Accommodation was above expectations clean comfortable and well located. Front desk service excellent and restaurant had a good and not expensive menu. Packed meals available on request. Tour Rutas Andinas guides were professional and sufficiently versed in the relevant botany, biology and geology. Included meals were good quality and sufficient quantity. Final 'sunset tour' - part of the Moon Valley tour involved the best Chilean wine we have tried. Pickups and transfers all went to time. HOWEVER due to the delay of Latam's flight from Santiago to Calama the tour operator Turavion is chasing us for compensation for the delay despite having a full or near full vehicle for the transfer. Turavion were also advised by us and others some four hours ahead of time of the delay.Else we may have given the tour 5 . The 4 day tour of Atacama was excellent. The tour guides were experts and they were always on point. I would definitely recommend this company and it's worth every penny. They take you at the best times to avoid crowds and all the secret spots others don't know about. If you are thinking about it. Don't or you'll regret going with someone else. Everything was great, the service and professionalism of the chilean staff were much more than what I expected, I highly recommend Viator and this tour. I think it's a scam that this tour is described as a 4-day tour, cause it's 2.5 days long at best. I booked four days in san pedro on the basis of this tour and now have to make my own arrangements for 1.5 days of it. I'm also unclear what about it cost 1300 usd - looking at prices in town, i could have easily organized a more active tour for myself within 1 hour of arrival, with 400-500 usd to spare. Amazing experience. The tour company was very professional from start to finish with great English speaking guide and really good driver. The destination is incredible. I booked online very easily and everything worked out as planned with tour really personalised. The trip was terrific, perfectly suited to two 60-somethings who love different experiences and some creature comforts. Every activity, including airport transfers and all 3 excursions, were on time, as advertised, and well-run, with lovely surprises. The guides Leonardo and Michelangelo were well-versed, helpful, and understanding. The driver was careful and reassuring. Our hotel, Poblado Kimal, was charming. Each room is a little cabin with a sitting area, refrigerator, Jacuzzi and outside patio. Quite comfortable except they heat up during the day and there is no ventilation other than the front door and a small window in the bathroom. This hotel has a very good restaurant attached to it, open for breakfast from 7:30-10:30 and for dinner until 10pm. And a spa that we did not take advantage of, but seems lovely. The staff were always present and accommodating. Be advised that this is not an all-inclusive, organized tour. The package is the hotel and 3 excursions, which include two meals. The rest of the time you're on your own. This was perfect for us except we would have liked a more active contact person as a sort of Organizer as some questions remained unanswered until we were in the bus. E.g., do we really need hiking boots? Answer: No. San Pedro itself is a bit of a surprise: a small, dusty, rustic town reminiscent of the US Old West with a hippie vibe: backpackers, tie-dye, tattoos, dreadlocks and sand-boards. And many dogs in the streets but not much poop. It has quite good restaurants, much better than typical. The 3 excursions hit the high points of the area, but there are others to consider. There are SO MANY tour operators in town that I dont know how youd decide on which to use once youre there. Also be advised that they are at altitudes up to 14K feet, so you need to be aware of your own limitations and needs for which there is no preparation. My wife had a hard time but felt it was worth it. It was all unique and memorable.